to The Reticuli Deception still isn’t available. I promised The Eridani Convergence for Fall this year, then November. Technically, the end of Fall isn’t until December 21, so I should just make it. It turned out to be a much longer and somewhat more convoluted story than I thought, laying the groundwork for the next few books. (When done, I expect T-Space to cover a 12-book arc, including the Alpha Centauri trilogy and a final trilogy which wraps up loose ends. There will probably also be a few side novels and short stories set in the same universe.) Rather than drag it out for another six months and 200 pages, I’ve done some major edits on Eridani to bring it in line with the other Carson & Roberts novels, without leaving major cliffhangers. The next in the series will be out next year. More about that soon. The final cover is still a work in progress, with two different possibilities. (See above right). As far as the text, are just a few final edits left. Keep tuned, I am determined to have this available before Christmas. I made it! The book has been available for pre-order for a few days now, releasing today. The final cover is the upper one shown, with Roberts sitting on a crate waiting. Scientists this week announced the detection of an extra-solar planet around the red dwarf star Ross 128, which at eleven light-years, is one of the dozen or so (depending if you count binaries as one) closest stars to Earth. This particular planet, dubbed Ross 128 b in the standard nomenclature for newly-discovered exoplanets, is interesting for several reasons: (1) it’s “terrestrial”, meaning rocky and approximately Earth-sized as compared to a gas-giant, (2) it appears to orbit in the habitable zone, where temperatures are likely not too hot and not too cold for water to remain liquid (sometimes called the Goldilocks Zone, although it has nothing to do with porridge 😉 ) and (3) unlike most red dwarf stars, Ross 128 is relatively “quiet” — it isn’t subject to massive solar flares. The last is worth noting. We’ve discovered planets in or near the habitable zones of other red dwarf stars, most notably Proxima Centauri (also known as Alpha Centauri C). That’s less than half the distance of Ross 128, but Proxima is known to undergo massive flares that would likely cook (through UV, not heat) any organisms living on planet Proxima Centauri b. So this recent discovery is much more conducive to life. But not, as the saying goes, life as we know it. The sunlight on Ross 128 b (or Proxima Centauri b, for that matter) is dimmer than it is here on Earth. More of the star’s radiation is in the red and infrared range than in the visible frequencies of our Sun, and it’s particularly deficient in one the frequencies used in photosynthesis (as we know it). Life may well still exist on a suitable planet orbiting a red dwarf (and we don’t know for sure that Ross 128 b is suitable, just that it could be), but it will be different. By the way, for an excellent non-fiction work on the possibilities, see David S. Stevenson’s Under a Crimson Sun: Prospects for Life in a Red Dwarf System published by Springer (2013). I used that book in my research for my upcoming The Eridani Convergence, part of which takes place on a planet orbiting a different red dwarf, Kapteyn’s Star. MileHiCon 49, and book promos! It’s the weekend for MileHiCon, the Denver regional science-fiction convention, at the Denver Tech Center Hyatt-Regency hotel. I will be there for the weekend, including panels Friday afternoon and Saturday morning, and the mass autographing Saturday afternoon. Find me and say “hi”. And for those who can’t make it, there are two Amazon promotions running. From Friday through Sunday, the ebook of Alpha Centauri: First Landing is free. The second volume, Alpha Centauri: Sawyer’s World will be on a “price countdown” (where the price starts low (99 cents) and increases over the next several days) from midnight Saturday (01:00 am Sunday 10/29 Mountain time) through the week, going back to full price next Saturday (11/4). Buy early! 😉 This is also a great opportunity to promote First Landing to your friends who might like it. Amazon lets you buy an ebook as a gift and they’ll mail a redemption code to your designated recipient; I assume that will also work for this price promotion. And The Eridani Convergence is almost ready for release. I hope to have it available for pre-order in a week or so. Tau Ceti exoplanets, new information. This past August (2017), however, the estimates were revised. The data suggests only four planets, with b, c and d (the former inner three) being replaced by g and h (the labeling is purely chronological by discovery date). Both of these are too close to the star to be habitable. Tau Ceti III (officially, Tau Ceti e currently), however, is within the Habitable Zone, where water could be liquid. Good thing, too, because that’s where I put it back in 2011 when I wrote The Chara Talisman. Unfortunately, it also turns out to be a “super-Earth”, coming in an anywhere from about 3.2 to 4.6 times the mass of Earth. I have several chapters set on Skead (as I call Tau Ceti III) in the upcoming The Eridani Convergence, although not all that mass is in the planet (it has a large moon, too). So, I’m back from the LaunchPad astronomy workshop for writers. It was awesome. Met some great fellow writers, and learned some more astronomy. (While a lot of it was refresher — which didn’t hurt — some of the stuff on exoplanets and galactic black holes was particularly new and useful.) If you’re a writer of anything, not just hard SF, look into attending this. The first two volumes of the Alpha Centauri series, First Landing and Sawyer’s World are doing well. BTW, when I last checked, Amazon was still selling the trade paperback of Sawyer’s at a few bucks off the list price. That also entitles you to the ebook at Amazon’s special “match book” price, less than a dollar. I’ve been squeezing time in to read a few other books. Dennis E. Taylor‘s “Bobiverse” series is a hoot, and a very different take on near-star exploration from mine. I’ve also discovered Marko Kloos‘s (he was at LaunchPad too) “Frontlines” series, yet another very different take on the nearby stars (although coincidentally, we roughly agree on the time line). I’m halfway through the second volume (Lines of Departure). It’s military SF, and the first volume (Terms of Enlistment) has some of the same flavor as Heinlein’s Starship Troopers or Scalzi’s Old Man’s War, yet different takes from both. Very enjoyable reads, and I’m taking notes* for when interstellar war eventually breaks out in T-Space (four or five books from now, probably). Quick update: First Landing free, Sawyer’s World released. A hasty and, sorry to say, a bit late update. Alpha Centauri: First Landing is temporarily available as a free e-book from Amazon. The second in the series, Alpha Centauri: Sawyer’s World is out and available (both e-book and trade paperback). After the free period, First Contact will go on sale at $2.99 (reduced from the original $4.99 price), or something roughly equivalent in local currency for non-US sites (I try to round down). I spent most of the past week at a computer conference in Austin, and I’m in the middle of doing a re-finance on my mortgage, so things have been a little crazy for me lately even without making sure Sawyer’s World was ready to go this month as promised. The next (third) volume, The Return, is almost complete, and it will tie up threads from the first two. Anticipated release is just after the July 4th weekend. There will probably be a fourth in the Alpha Centauri series, Alpha Centauri: Kakuloa, following on after The Return but focusing less on Drake, Carson, Sawyer and company, and more on later events on Kakuloa (such as the rise and fall of the squidberry industry alluded to in the Carson & Roberts series), bridging the narrative gap between the first missions and (at least) the Jason Curtis adventures. HTTPS – I’ve enabled the website for https access (thus https://www.alastairmayer.org and so on). At the moment, your browser might complain about the certificate. Temporarily I’m using a self-signed cert, which in general you shouldn’t trust unless you know what’s going on. But you shouldn’t be posting any sensitive information here anyway. No doubt you’ve seen it before with other sites. Books and Covers – some of my older covers look a bit outdated, I’m looking into doing a refresh to coincide with new volumes in each series coming out. 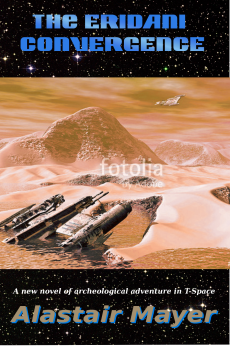 And I kind of want to change the ship on the cover of Alpha Centauri: First Landing to look more as described in the book. And speaking of looking outdated, this whole website could stand a refresh. Coming Real Soon Now. Publishing Schedule – Alpha Centauri: Sawyer’s World is about to go to edit, and barring major changes should be out sometime this May. I’m hoping for sooner rather than later, I’ll keep you posted. (For faster updates, and some special offers, join my mailing list. See below.) The Eridani Convergence, third in the Carson & Roberts series (aka the Starship Sophie series, still trying to find a good name to differentiate those books from other mini-series set in T-Space) is past the halfway point on the first draft. Target is as soon as possible after Sawyer’s. 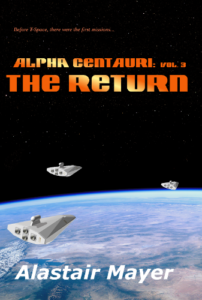 There will be at least one more in the Centauri series, Alpha Centauri: Kakuloa, covering the return to that planet and segueing into the era of the Jason Curtis stories. Mailing List – Some of you, I know, have been wanting more timely updates on what’s happening with the next books in the series, and I’d like to offer my fans something extra for their loyalty. Perhaps advance notification of special deals and events, freebie short stories or novelettes, background material that isn’t in the public wiki, that sort of thing. No spam. Here’s a link to the signup page.